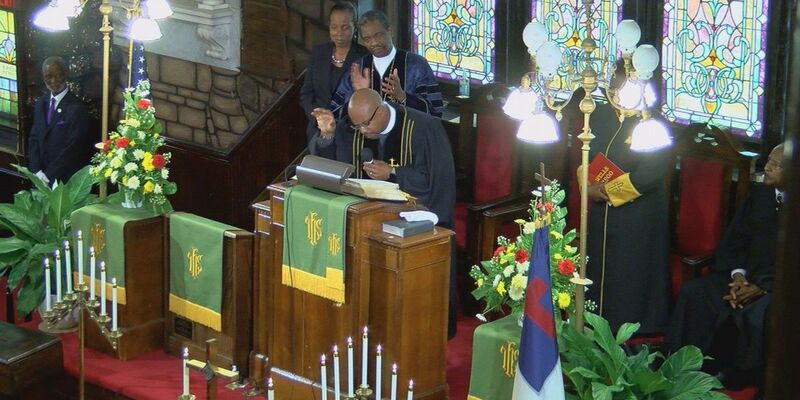 (Photo Source: Live 5 News) Newly appointed pastor at Mother Emanuel AME Church, Rev. Eric Manning. CHARLESTON, SC (WCSC) - On Sunday Mother Emanuel AME Church received its first sermon from its newly appointed pastor, Rev. Eric Manning. He previously served as pastor at Bethel AME Church in Georgetown. This new appointment comes in the same week the former pastor of the church, Rev. Betty Deas Clark was appointed to another church by the 7th District AME Church District Bishop Richard Norris. The pews were filled at the church with both church members and visitors as usual. "A lot of people within the city of Charleston, everyone is asking 'why, why, why', but we come back to... we have to learn how to trust God in everything and with everything and it's hard," Rev. Manning said. "When we do we know that everything always has a purpose." A reason has not been revealed as to why there was a sudden change in leadership. It was a quick transition and Rev. Manning's initial thoughts were "who am I to serve such a wonderful congregation, who am I to serve such a wonderful group of people." He says he was asked to fill the position by the Bishop on Tuesday, he is humbled at the tremendous opportunity to serve. He delivered a message on the Psalm 23 at the Sunday service. He says it's "something that everyone understands, they can resonate." The message was about following God's lead. "Just give me wisdom so that I can understand how to lead your people that's what I've been asking God to do for the remaining parts of this week," Manning said. He says it's also a passage that provides comfort and reassurance for those going through difficult times. "A lot of times we think that various people will get through tragedies a lot faster, but then you don't really know where people are until you get to know them," he said. "I pray I get the opportunity to know where they are." He says the transition in churches come with different emotions, but he is ultimately thankful for to be called on for the new responsibilities and this new journey. "There are times when we still reflect and tears still come from having to leave such a wonderful congregation," Manning said. "The tears quickly turn to joy when you think about the opportunity to be able to share with this wonderful congregation who welcomed us and embraces." As an itinerant elder in the AME Church transitioning between churches is a part of the duty. He says church appointments can range in time frame. Adjustments can be made at anytime under the discretion of a church's needs and the presiding prelate. Rev. Manning was introduced to the congregation at the service by the former interim Pastor of Emanuel. Presiding Elder Rev. Dr. Norvel Goff. "He comes prepared both in head and heart," Rev. Goff said during the service. Manning wants to get to know the children of the church just as well as the adults while serving the community.